well-temperedforum.groupee.net The Well-Tempered Forum Off Key Best way to cook rice? Best way to cook rice? Hi, I've been envying the way the local Indian restaurant turns out its white rice, all fluffy with every grain separate. I can't get it that way at home. I know my Jaffrey book says to wash and rinse it several times, then soak it. I don't have the patience to get it to where the water is almost clear, so that method is not for me. Not sure I'm ready to invest in a rice cooker, but if that's the best option I may consider it. I don't like having too many appliances around. Been a rice cooker household for more than 25 years. 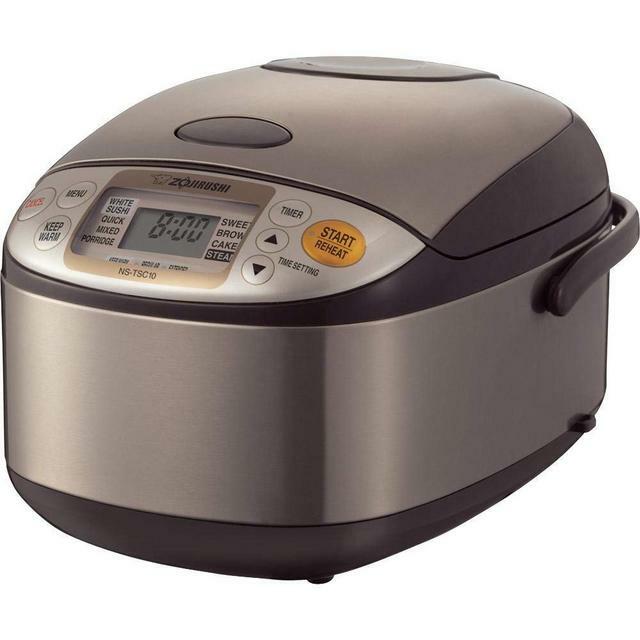 Bought a high-end Zojirushi that was kind of an early Instant Pot for me. Then I got an Instant Pot maybe a couple of years ago. Have hung on to the Zoji because it's a great machine. The Instant Pot has a rice setting, but I don't know how good a job it does because I still use the Zoji for rice. Well, except for biryani, which is fabulous in the IP. Otherwise I imagine it's pretty much the same as a standalone rice cooker. I think you'd enjoy the IP for more than just cooking rice. It may have something to do with the variety of rice they use. Sneak around to the back of the restaurant and look for an empty rice bag in the trash. Zojirushi, the Cadillac of rice cookers. I'm sorry, I'm too brain washed to consider alternatives. You can cook other grains in the fuzzy logic Zojis and the IP. Steel cut oats, for instance. No burning. No boiling over. No muss, no fuss. Zojirushi user here, 16 years now. Also, stating the obvious, not all rice is the same. Thai usually uses jasmine rice, Indian uses basmati. I've become a huge fan of Yotam Ottolenghi's rice recipes. Here are a few. For the first, I don't have access to curry leaves, so I've used basil leaves and lime zest to approximate. Actually, rp, you might enjoy his cooking, regardless. I believe it's completely vegetarian or, if not, highly veggie oriented. Zojirushi is the best rice cooker EVER. Those recipes look great, Nina! Will try them soon. My understanding is that aged basmati is the way to go for fluffy. I buy mine at Costco; the brand name is Royal. So now using the Zoji for rice! Looks like the one in SK’s picture. I needed a replacement for a Hamilton Beach rice cooker that I had had since college that was circling the drain, and this was the closest thing to it in size and general construction that Mr. Lisa could find. I was skeptical at first - I wanted something that cooked more rice than my Hamilton Beach one since we never seemed to have enough. But this one is fine. It's basically idiot-proof. Add the rice, fill up to the marked line with water, put on the lid, push one button. Makes great rice every time. The instruction book talks about rinsing the rice but I have never done that and it's always fine. And it's tiny - takes up very little cabinet space. I will say that while it says it cooks 3 cups of dried rice, they are not 3 real cups - it's 3 of the special measuring cup that comes with it. The cup is about 6 oz so it ends up being basically a little more than 2.5 c of dried rice. I almost sent it back because of that, but it makes just enough more than my old cooker that our family doesn't run out of rice anymore so I'm happy. I'm delighted to see all the Zojirushi fans here!!! They really are the best! We love our Zojirushi. We use it at least once a day. We use it for rice as well as oatmeal. Thanks, everyone. It sounds like the Zojirushi is the way to go, but I have to decide if I make rice often enough to justify it (about once a week, and I realize you can make other things in it). It shouldn't be that hard to make it on the stovetop. People have done that for millennia. I just want to do it right. Quick Reply to: Best way to cook rice?